Visitors to MyResistance.net, the official site for the Resistance franchise of PS3 games, say the site was serving up malware yesterday. One of them alerted Insomniac Games, and now the entire site has been taken offline for maintenance. The hacking and malware allegations could not be immediately verified with Insomniac or Sony Computer Entertainment America. The site itself is owned by Sony, with Insomniac providing moderation and content support. The studio thus is referring inquiries directly to SCEA. This morning Kotaku reached out to representatives of both; any statement the studio or Sony makes will be updated here. This site outage comes a week after an attack and defacement of the Steam Forums that brought them down for nearly five days. Worse, Valve later said that a database containing user information, including encrypted credit card numbers, had been exposed in the attack, and advised users to monitor their credit card activity and change passwords elsewhere if it was the same as their Steam Forum login. 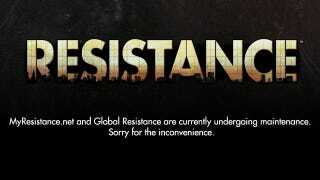 SCEA discovered unexpected activity on its Resistance website, MyResistance.net, which includes the Resistance forums and the online free strategy game, Global Resistance. As a result, the website was taken down. MyResistance.net does not collect any credit card information, and we are working to get the site back up as soon as possible. We've inquired further about the malware allegations, if the site was in fact serving it to visitors and, if so, if SCEA knows the nature of it.